Are you sensitive to certain sounds? Hyperacusis is the perception of unusual auditory sensitivity to some environmental noises or tones. The particular symptoms of cochlear hyperacusis and vestibular hyperacusis can help physicians and audiologists distinguish between the two disorders. The effects of hyperacusis can range from a mild sense of unease to a complete loss of balance or upright posture with severe ear pain. In serious cases, it can cause seizure-like activity in the brain. Hyperacusis can be associated with auto-immune disorders, traumatic brain injury, metabolic disorders, and other conditions. It has not been sufficiently studied in the adult population and is often ascribed to psychological conditions rather than being recognized as a physiologic symptom of cochlear or vestibular damage. 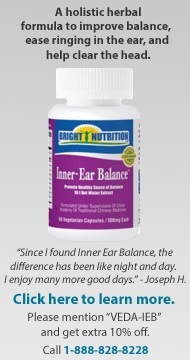 The hearing and balance systems of the inner ear are interconnected. Both systems are filled with fluid whose movement stimulates tiny sensory cells. Sounds are detected as energy vibrations; the human cochlea can hear best the frequencies associated with speech. The balance system uses lower-frequency sensations to help maintain posture in relation to gravity. Hyperacusis is an abnormal condition in which the complex electrical signals generated by sound vibrations are misinterpreted, confused, or exaggerated. The signals coming in are identical to those that present to a normal ear, but the reaction in the abnormal system is markedly different: for example, the sounds in a quiet library may seem like a loud parade to a person with hyperacusis. With cochlear hyperacusis, subjects feel ear pain, discomfort, annoyance, and irritation when certain sounds are heard, including those that are very soft or high-pitched. Most people react by covering their ears or leaving the room. Severe emotional reactions may also occur; crying or panic reactions are not uncommon. In vestibular hyperacusis, exposure to sound can result in falling or a loss of balance or postural control. Such disturbances have been called by various names, including Tullio’s syndrome and audiogenic seizure disorder. Some of the same reactions as with cochlear hyperacusis can also occur, along with sudden severe vertigo or nausea. In some cases, vestibular hyperacusis can affect the autonomic system and cause problems such as loss of consciousness, mental confusion, nausea, or extreme fatigue. In both cochlear and vestibular hyperacusis, headache is common. In addition, many subjects with hyperacusis feel distinct cognitive changes during these exposures and will describe themselves as being “out of myself” or disassociated from reality, unable to take in other stimuli, having an immediate feeling of something being wrong or a sensation of being unwell or experiencing severe confusion. The physiologic conditions underlying these symptoms cannot be identified with certainty because of difficulties involved with studying the very small inner ear structures without damaging them. A suspected cause of cochlear hyperacusis involves a loss of the regulatory function provided by the system that conducts impulses along the auditory neural pathways. In hyperacusis, the mechanism that regulates amplification erroneously magnifies the incoming sounds and noises instead of reducing them. For example, the sound of a passing car is interpreted as comparable to the roar of a jet engine! Other possible explanations of cochlear hyperacusis involve brain-chemistry dysfunction or head trauma that damages the chain of tiny bones in the middle ear that amplify sound and help transmit vibrations to the inner ear fluid. Changes in the transmission of electrical signals along complex neural pathways are also highly possible in cases of head injury. In vestibular hyperacusis, we suspect that the main pathology results from damage to the nerve cells in the balance system. These cells may suffer damage from trauma such as head injury, metabolic disruptions due to chemical ingestions (e.g., medications or anesthesia), or circulatory changes due to heart disease or artery blockages. In addition, autoimmune disease, which can be triggered by many different causes, can harm the balance organ. Head trauma in a motor vehicle accident can set off an autoimmune reaction in the inner ear that can destroy the nerve cells, often weeks or months after the initial injury. In one clinic, several serious cases were evaluated where simple soft auditory stimulations of less than 30 decibels (comparable to a mid-pitch musical note played at a very soft level) elicited loss of consciousness and seizures. All of these patients had suffered head and/or neck injuries in motor vehicle accidents that affected the brain stem and higher areas of the central nervous system. None of these patients had significant hearing loss or previous balance problems. One person loses balance and consciousness frequently and must use earplugs and earmuffs all of the time to avoid injury from falling. Special audiologic tests can reveal the presence and severity of cochlear hyperacusis. Simple tests such as the Loudness Discomfort Level test (promoted for use in hyperacusis assessment by Drs. Pawel Jastreboff and Jonathan Hazell) and balance screening using an audiometer and observation take only a few moments and can yield significant information. Cochlear hyperacusis can be treated with acoustic therapies such as tinnitus retraining therapy (TRT). The Jastreboff TRT method is the treatment of choice and can result in the recovery of normal or near-normal dynamic ranges of sound tolerance. Vestibular hyperacusis, however, continues to go untreated or unrecognized in many cases. When vestibular hyperacusis is recognized, the treatment protocols vary widely, depending on the level of expertise and interest of the treating physician. Treatment with a low-salt diet combined with anti-nausea drugs still dominates medical approaches, although there are some pioneers—such as John Epley, MD (Portland Otologic Clinic, Portland, Oregon)—who have had promising results introducing anti-inflammatory medicines directly into the cochlear/vestibular system using catheters. For individuals who complain of loss of balance with exposure to sound, thorough diagnostic testing should be completed in otology, neurology, and audiology offices. Innovative testing protocols could be devised to provoke or produce a response in a clinical setting. In the clinic, presenting a tone at 500 Hz and gradually increasing the loudness can often induce vestibular hyperacusis. It is important that clinicians present tests tailored to the individual patient’s situation. For example, if someone complains of falling when large vehicles pass by, identifying the specific problem area may require changing a test to include lower-frequency tones at very low volume levels, or narrow-band noise, or even white noise. A portable audiometer might be used in conjunction with a computerized dynamic posturography test so that various sounds can be presented to induce a balance response. Another possibility is to utilize electroencephalography (EEG) with an audiometer to present sound stimulation, so that shifts in brain-wave patterns in response to sound can be observed. We used this strategy in our clinic recently to produce clear evidence of brain-wave anomalies, providing proof to a patient that the source of her troubling symptoms was organic. Her constant falling and loss of consciousness were based on a physiologic condition, not a psychological one. These results provided a sense of relief to the patient, whose previous EEG results, without sound stimulation, had been normal. Adapting clinical assessment tools with the use of various stimuli and then making careful observations may allow medical providers to identify patients with vestibular hyperacusis and to devise better therapeutic strategies. Click here to download a copy of our publication "Cochlear and Vestibular Hyperacusis." Click here to read stories about patients with hyperacusis on The Mighty.